Lifestyle Photographer Swinging Color! | Studio 3, Inc.
It’s been a while since I painted with light and I thought instead of fighting the motion (my first plan), I’d use it to my benefit! Luckily Studio 3 had this wonderful concrete wall built for a previous job that I thought would be a great backdrop for this idea. I set-up the Speedotron Black Line 2400ws strobes and a red gelled Mole-Richardson 2k continuous hot-light, which was carefully flagged off. I did this so that it would mostly fall on the racket as they were moving. I set the exposure to about 1 or 2 seconds depending on how long I needed for the trail and fired the Canon 5D MarkIII camera when they started moving. 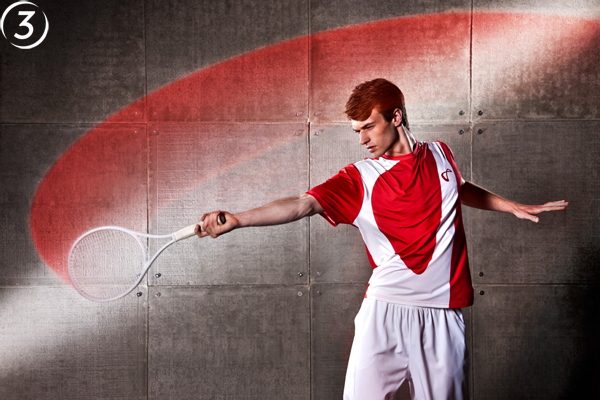 Then with the pocket wizards in hand, I fired the strobes manually at the end of the swing so the red trail would be behind the tennis racket from the direction they were swinging. Had I fired the strobe at the beginning of the exposure, the red trail would have been in front of the motion, which visually wouldn’t make any sense at all. 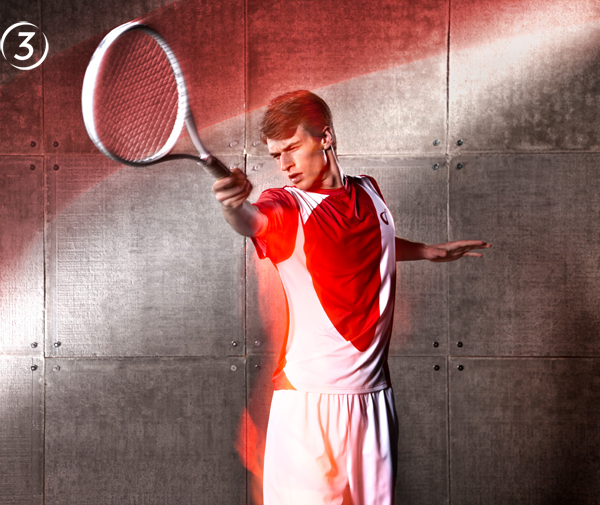 This shoot was a blast and required some coordinated button-pushing and obviously very talented tennis models! Truly makes a photographer understand that their tool is not a camera, it’s light. I can’t wait to try this again with a different color. Any suggestions on the color I should work with? To view more Lifestyle images created at Studio 3 please click here!